The MFN CONSULTING GROUP created the The Military Fresh Network, which is a lifestyle brand and community for our service members and veterans. The MFN GROUP did this by utilizing social media, website and the Military Fresh clothing line to connect service members and veterans with like interests. We utilized User Generated Content (UGC) with authentic and organic stories and Military Influencer Marketing (MIM) to catapult the brand message. This was done across all social channels so that prospects and influencers can experience the “realness” of what it’s like to serve in the military while providing a platform for our military members and veterans to shine and connect with like minded individuals. The Military Fresh Network is a Military “LIFESTYLE” Brand that connects service members and veterans from all U.S. Military Branches. It was created to highlight and elevate all of the extraordinary things our service members and veterans are doing in and out of uniform. 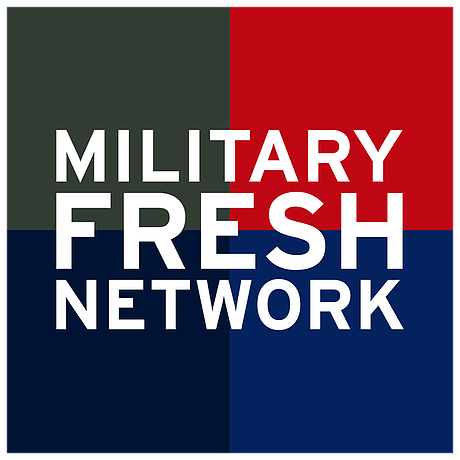 Since the Military Fresh Network brand was created it has become the hot spot for brands to identify military members and veterans with desired expertise or background. We have created the ultimate platform to tell their story. 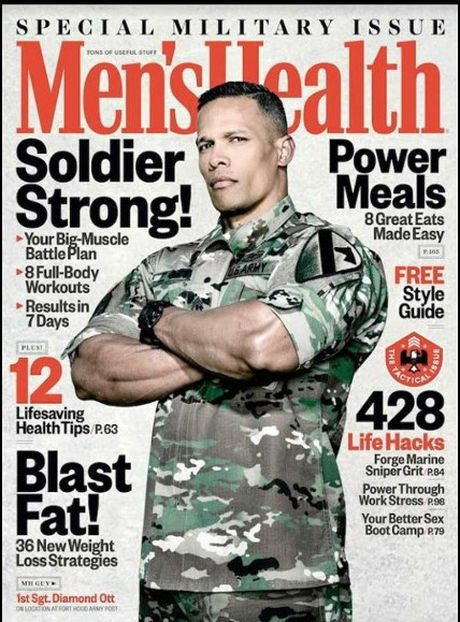 The MFN CONSULTING GROUP created localized outreach and fitness events for the Military Fresh Network community and its supporters. 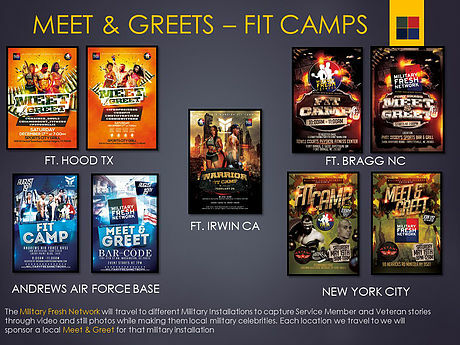 These events drove awareness, engagement and activation for the Military Fresh Network community. Each event gained more attendees, supporters and those wanting to find out more. As a result of our work, the client was able to see measurable results, ultimately leaving both parties ecstatic. 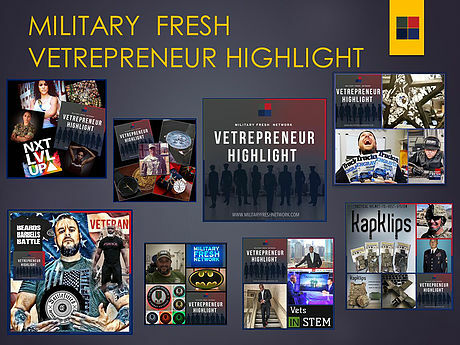 The MFN CONSULTING GROUP created a campaign called the “Military Fresh Vetrepreneur”. This campaign was designed to bring attention to service members and veterans with veteran owned businesses. This campaign was catapulted across all Military Fresh Network social media channels utilizing the hashtag #militaryfreshvetrepreneur. The Military Fresh Vetrepreneur campaign brought awareness to veteran owned businesses and bridged the gap between the consumer and thier brands. 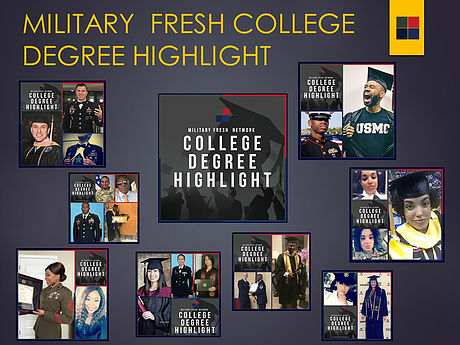 We’re especially proud of our work on the Military Fresh College Degree highlight. That’s because we know that research ows that individuals that join the military all clients need a winning, creative approach, and we were able to deliver that in this Fashion Line Marketing project. Here, MFN CONSULTING GROUP utilized our subject matter experts and integrated their knowledge throughout various disciplines across the entirety of the project. And this is how we approach every project we take on. We loved working on this #MILITARYFRESHWORLD Campaign project. It was a project that truly gave us a chance to do something new, shine bright, and take an unorthodox approach that highlights this brand’s unique value and lifestyle. We did just that. Delivering one-of-a-kind service, in conjunction with measurable results, we brought the client great success that they can truly be proud of. We utilize promo cards across the entire Military Fresh Network Brand to encourage Brand Ambassador to spread its message through Word of Mouth (WOM) Marketing and Share of Voice. 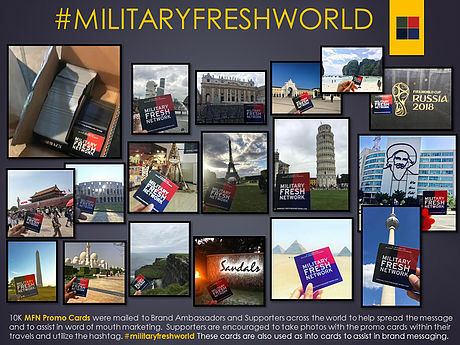 In this case, we wanted to the world know that our military members are everywhere, so we started the #MILITARYFRESHWORLD campaign and encouraged this community to take a unique photo within their travels holding the MFN promo card and use the hashtag #MILITARYFRESHWORLD. You can see the results for yourself. THE MFN CONSULTING GROUP HAS CREATED THE ULTIMATE MILITARY PLATFORM FOR OUR SERVICE MEMBERS AND VETERANS.